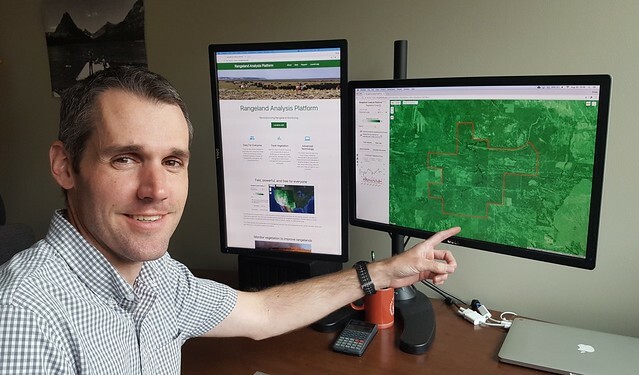 Brady Allred, the app’s creator, said the online platform provides the first-ever annual vegetation cover maps, which are designed to help improve America’s rangelands. Photo by David Naugle. To meet this challenge, the Rangeland Analysis Platform (RAP) provides the first-ever vegetation cover maps for rangelands from the Great Plains to the Pacific Ocean. Created by the University of Montana in partnership with USDA and U.S. Department of Interior (DOI), this easy-to-use technology provides trends in rangeland resources from 1984 to present at the ranch, county, and watershed scales. 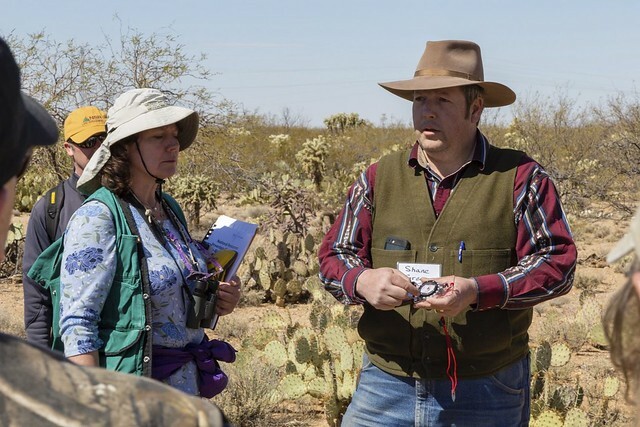 Shane Green, a range management specialist with NRCS in Utah, said this app will better equip him to work with ranchers on planning and implementing conservation practices on rangelands. Photo by Donny Peterson. The RAP revolutionizes monitoring because it provides a view of rangeland resources at an unprecedented blend of time, space, and scale. This is accomplished through field data, satellite imagery, and the cloud-based computing power of Google Earth Engine. “By working with Google, we harnessed decades of satellite imagery, trained it with on-the-ground field data, and put it at the fingertips of practitioners,” said Brady Allred, the app’s creator and professor of rangeland ecology at the University of Montana. The app relies on over 30,000 field plots collected by NRCS’ National Resources Inventory and the Bureau of Land Management’s Assessment, Inventory, and Monitoring datasets. The maps and charts produced by RAP, coupled with site-specific knowledge, provide a powerful tool for improving grazing land resources. Spanning the entire west, the RAP encompasses regional differences. For example, the app can identify where to reduce woody encroachment in the Great Plains, evaluate effectiveness of cheatgrass treatments in the Great Basin, and help people visualize the impacts of drought across the Southwest. This new technology helps NRCS meet its goals for partnering with private landowners to conserve rangelands. Since 2010, NRCS Working Lands for Wildlife has helped over 2,000 ranchers restore and protect more than 7.5 million acres of grazing lands. The app is available for free at rangelands.app. Learn more about how to use it during this webinar at 12pm EST on September 25. This graph, produced by RAP, illustrates how vegetation responded to a prescribed fire in Nebraska in 2015, which was designed to remove encroaching conifers to improve forage for livestock and wildlife. It shows that average tree cover decreased from 18% to 2% post-fire, making more room for perennial grasses and forbs. Interested to see if this technology would be integrated with any other Civil engineering software technology.